Below are some of the things we do to achieve these goals. The Green Swing conducts a Life Cycle Assessment (LCA) for all our projects to assess how much energy goes into the different stages of a building’s life. We work closely with Perth based company eTool to assess and improve the results. LCA is an accounting method that assesses each and every impact associated with all stages of a product or process over its life span. 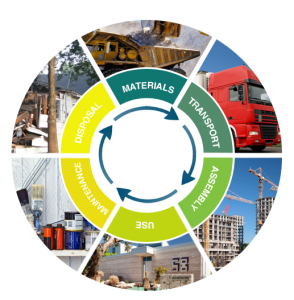 The approach is sometimes referred to as a “Cradle to Cradle” assessment if it accounts for full recycling at the end of the products design life or just “Cradle to Grave” if it takes the product through to disposal only. LCA of the built form involves quantifying the total “Embodied Energy” and the “Operational Energy” over the entire design life of the building. Energy can then be converted in CO2e using applicable coefficients relevant to the primary energy source and efficiency. Materials – Energy used to extract the raw materials and process them into useable building products available at the gate of the factory (“Cradle to Gate”). Transport – Energy used to transport the building materials from the factory gate to the building site. Assembly – Energy used to construct and create the building. Use – Energy used when living in the building. Maintenance (Recurring) – Energy used to maintain and replace certain building elements over the entire life span of the building. Disposal (Demolition and Recycling) – Energy used to demolish and recycle the building and feed the resultant materials back into the building materials “food chain”. The “Operational Energy” is the amount of energy required to run the building over its design life and includes appliances such as Air-Conditioners, Hot Water systems, Refrigeration and Lighting. 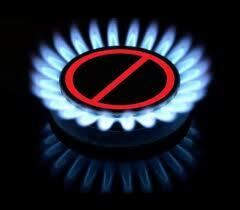 Natural gas is often used for cooking, hot water and heating. We have decided not to connect to natural gas. 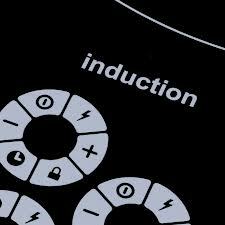 Instead we use induction for cooking and electric boosted solar hot water systems. We believe that space heating will not be required thanks to good solar passive design. Natural gas is not a renewable energy source whereas electricity has the real potential to be 100% renewable. Gas has a negative impact on indoor air quality, particularly in homes that are well insulated. We are concerned about the risks of gas industry. Fracking in particularly poses huge risks to our water supply and farm lands. We acknowledge that connecting to the grid means we are still using electricity generated by coal fired power stations. We also know that from a life cycle analysis (LCA) perspective, at the time of writing, gas still comes out ahead of electricity. This is because LCA is unable to take into account the prediction of lower energy intensity of the grid in the future. However, we think the game is changing. In the design of our projects we try to maximize the amount of north facing roof space for solar hot water systems and photo voltaic (solar) panels with the aim of ensuring that overall we produce enough energy to cover the needs of the whole development. The Siding has a charging point for electric vehicles in each garage. Battery storage will be considered for future projects. The price of energy is rising and many households receive bills into the hundreds of dollars. The Green Swing designs homes that make it easy for people to use less energy making the homes truly affordable to live in. Australian homes use around 40% of their total energy consumption on heating and cooling. The Green Swing minimizes the need for heating and cooling by designing homes using passive solar design principles. During the design phase (Development Application or DA) we conduct preliminary energy assessments to help determine whether the design is on the right track and get recommendations on where improvements can be made. This is very pro-active way of using energy modelling and is very different compared to solely using it for compliance reasons. The preliminary energy assessment results are finalised the building license application phase. Most Green Swing homes have a 9-10 star energy rating and require little to no heating or cooling. Our homes come with energy efficient appliances. We use the energy and water consumption star rating to guide our decision making. Quality and price are other important selection criteria. It is important for the future occupants to know how to operate a passive solar home. We try to assist and provide information to future owners and occupants in this area. We also like to help with other ways on how to reduce your energy consumption. A simple measure is switching off appliances at the wall. Many other hints and tips are available; your energy supplier’s website should be a good starting point. Instead of looking at the energy efficiency of an appliance, we think the first question should really be Do I really need it?” We thought long and hard about whether the buy a dishwasher or not (yes we did get one), and definitely still question the need for the sheer number and size of audiovisual equipment you can find in many homes these days. Energy monitoring devices are becoming more widely available and research has shown that they can result in a reduction in energy consumption of between 5-10%. For this reason, our new homes will be fitted out with energy monitoring devices.